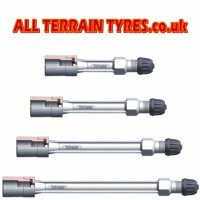 Top quality plastic truck valve extensions to extend the tyre valve to a more accessible position. High quality material combined with reinforcing ribs ensure long life and no leaks. Plastic extensions are preferred over brass extensions by emergency service vehicle workshops because they will break away without damaging the actual tyre valve so preserving the tyre pressure should an object pass between the wheels.